Enjoy a comfortable journey in Egypt “Land of Pharaohs” for 3 nights/4 days Cairo and Alexandria itinerary joining a private Egyptologist tour guide to discover the most famous monuments in Cairo and Alexandria such as the Pyramids of Giza, the Egyptian Museum, Alexandria Library, The Catacombs, Qaitbey Citadel, and Pompey’s Pillar. Book now! Arrival to Cairo airport, our representative will meet you at the airport then you will be transferred by a private A/C car to your hotel to check in. 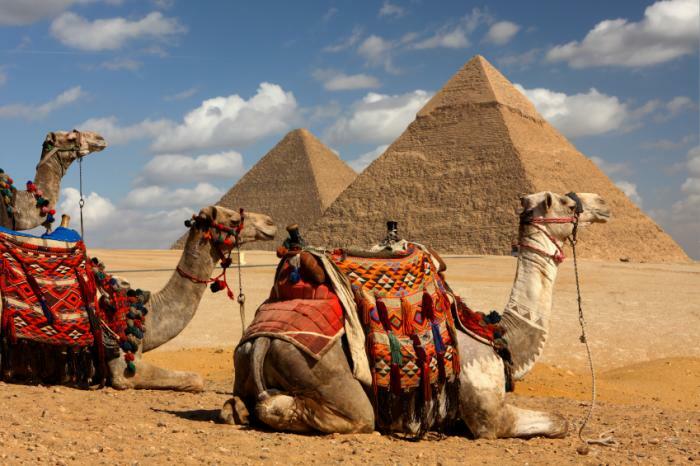 Giza Pyramids complex includes three main pyramids, six little pyramids, the great sphinx and the Valley Temple. The complex dates back to the 4th dynasty 2400 years B.C and one of the top Egypt tourist attractions. A copy of every book published in the world is kept in the Alexandria library, making it one of the great literary sites in the world. The library also houses several exhibitions relating to the history of Egypt and a display of rare antique books. At the end of the day, we will transfer you back to your hotel in Cairo for overnight. Breakfast at the hotel then our representative will transfer you to the airport and assist you at the airport final departure formalities to end your Cairo and Alexandria itinerary. An Amazing visit to Cairo and Alexandria , we were looked after every step on the way by Mya and her drivers . Picked up at airport and dropped back all on time , all the tours over the 4 days were fantastic as well as the evening boat cruise , quality of restaurants for lunch were outstanding and nothing was to much trouble , they even arranged to stay late one day so we could add the sound and light show that wasn’t part of the Itinerary. Mya was an excellent host , perfect English and really knows how to look after you and here knowledge of Egyptian history is second to none . 5 stars plus to Egypt Portal Tours , Mya and the Drivers. First of all i would really like to thank Egypt Portal for the tour and the staff that they have as they showed me the true beauty of Egypt. I simply found them on google and booked a 4 day tour via Whatsapp. The day i arrived, i met them right away and we took it on from there. The tour planning was customizable and i truly enjoyed the fact that it was like that. My tour guider was Mohamad Haider. He did a very great job by explaining me the ancient history of Egypt, taking me to the best sightseeing, being always around me in case i have a question and not only that but he was a very honest and a nice guy. My private driver was Ahmed also a very nice person, professional and helpful. Bottom line is that i couldn’t of enjoyed Egypt without Egypt Portal.